Plus: Shaitels, New Kosher Law, Tnuva, Shaimos, Wines, Guide to Kosher Fish, New York City's Water! At 140 pages, this is our largest magazine ever. 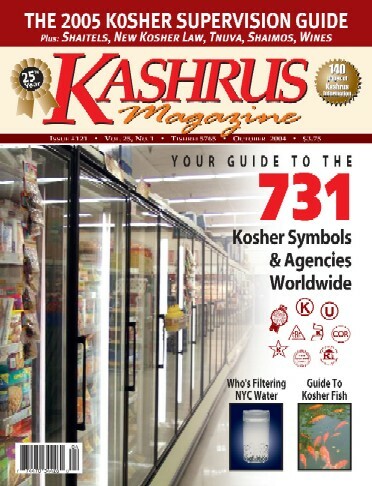 It is packed with some powerful issues and a good look at some of the kosher companies. We have the latest on water in New York City and how the â€œOUâ€� and other organizations are â€œcoping with the copepodsâ€�. There is a great article about sheitels and how our shatnez professionals helped many women feel secure about their synthetic sheitlach. There is an engaging piece, based on interviews with wine merchants across the US, as to which wines are popular today. Itâ€™s a great place to browse for new ideas on yom tov wines. The brainchild of Benny Goldstein, the (â€œOUâ€�-certified) Shaimos Box will prove invaluable in every Jewish household. Buy several. Give them to your shul, yeshiva, your children and position a few in different locations at home. It will keep your shaimos pile down and teach the importance of dealing with shaimos all 100% â€œOUâ€� kosher-certified. See the report on a new Israel-based anti-smoking organization and the gedolim that are behind it. Then there are the pieces on kosher companies. Kosher travelers will be happy to see what El Al is doing for them in terms of food, scheduling, special offers and new sensitivities to the observant traveler. As the saying goes, â€œEl Al Is Israelâ€�. Itâ€™s nice to know that they are trying to keep us loyal passengers. TNUVA is big news and our interview with their people is a beautiful piece to read. We talk about the business aspect, the kashrus, the whys and the wherefores. Readers will appreciate that TNUVA is building their own US distribution companies to handle their products. Supporting TNUVA will bring more of their product lines and other Israeli companies to these shores. We welcome back Empire as an advertiser in KASHRUS. Exciting things are happening at Empire and we hope to bring you complete details in an upcoming issue. The center of this issue carries a brochure and envelope for Rabbi Nathan Spectorâ€™s dynamic organization, Hamaayan Baâ€™negev. For as long as this magazine has been printing, I have closely followed the work of Hamaayan. Hamaayan is really a combination of nearly two dozen separate programs that Rabbi Spector has initiated and continues to maintain. And now he needs our help. Please use the envelope in the center of this magazine to keep this essential organization doing what it does best â€” meeting the Torah and social service needs of Jews in the Negev. If you drink wine, and who doesnâ€™t, clip and use the $4.00 rebate coupon which Royal/Kedem has provided (on the inside front cover) for their wines A great opportunity to try new wines at Kedemâ€™s expense.